This feature was submitted by freelance writer J.R. Williams. All photos are by the author, unless otherwise noted. Chicago Avenue used to have it all -- shops, theaters, department stores and restaurants. People used to hang out on the stretch of road between Damen and Ashland to catch dinner and a movie and to do some shopping afterward. It was a 1960s urban oasis if you will. Over the years, the area began to change. Businesses closed down, residents moved out and condos moved in. In a sense, it was like a death to the 'hood. But there is still a strong presence, a scent in the air that smells like a mix between leisure and fun with a hint of old school hard work. This is an area in limbo, trapped between beauty and grit, between no money and new. There's an evolution going on. And you can see it, in the eclectic shops and eateries that stand in the shadows of deserted storefronts and rundown brick buildings. But like many neighborhoods in the city, its charm lies in the unchanged. The Unchanged-like Deitch Pharmacy, the iconic Goldblatt's Building and the two fossilized theaters known back in the day as The Hub and The Alvin, which still stand today, all reminders of a simpler time. According to Richard Alcala, owner of Alcala Western Wear, "This place was hopping, especially on the weekends. You couldn't find a parking spot anywhere. It was jumping with shoppers because people would come all over just to shop at all of the shoe stores, all the clothing stores, Goldblatt's and Woolworth's. You remember Woolworth's?" Who doesn't remember Woolworth's? 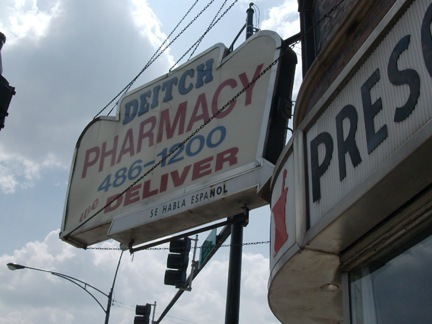 Deitch Pharmacy is alive and well. "We're still going strong and a lot of people are very happy that we're still holding on as far as an independent pharmacy. We do a lot of consultations. We get a lot of people who travel from all over the city just because of the personal, special touches they get," says Marta Kozyckyj, a Pharmacist at Deitch Pharmacy. And that's what this area is all about -- the special touches, the details like the façade on the old Goldblatt's building dressed in white terra cotta with wide, old Chicago style windows. "Chicago Avenue was a shopping district and our number one anchor was Goldblatt's. They had furniture, they had clothing, they had electronics, they had a basement filled with home goods. You walked into Goldblatt's and you could buy anything. They even had jewelry. When Goldblatt's stopped, that's when the retail went down a little bit," Alcala said. According to the Public Buildings of Chicago website, "The Goldblatt's was spared from demolition at the request of local neighborhood groups and declared a Landmark." It now houses various city departments. The Hub and The Alvin still stand, but both have altered functions. The Hub is home to Catholic Charities, while the old Alvin spot sits trapped in time. It's lined in brown butcher paper, hiding from the outside world, waiting to be sold, praying that it won't turn into dust in the meantime. These once bustling theaters were the heartbeat, but they're now dead. Can they be revived? Probably not. "I don't think it's going to be like the old days anymore. I don't think this is going to become a shopping mecca," Alcala said. But it will evolve. 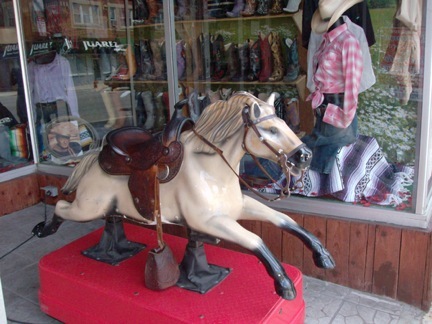 There is a lovely, life-size horse sitting outside of Alcala's Western Wear. This majestic and strong statue captures the spirited feeling of the neighborhood, the new heartbeat. According to Alcala, "The horse came from Lacrosse, Wisconsin. It belonged to another western store that was going out of business. Ever since we put the horse on the sidewalk, people know who we are now. When people saw the horse, it really made us a landmark." And the folks from the neighborhood do notice the horse; they care about it, even inquiring where it was when it was taken down for renovation. The children and the new residents stop to look at it. It is a landmark. Although some of the old businesses remain, there are many new businesses opening up in this changing neighborhood. Fayyad Abdallah, owner of Alliance Poultry Farms, noticed a significant change in the demographics of the community, especially in the last five years. "It used to be all Latino and now there are many urban professionals. New buildings and condominiums are popping up. Before, people moved to the suburbs and worked downtown. Then they thought, why don't we buy buildings, fix them up and live near downtown." Many businesses welcome the changes on Chicago Avenue. "You see a lot more foot traffic. Young couples have gone into some of the rehabbed buildings. I think it's been a positive change. The only downside is obviously the economy, which has forced some people out of their homes. It would be nice to have some of the independence stay in the area -- they serve a purpose," Kozyckyj said. And there are numerous small businesses taking interest. There is an avant garde salon, a pie shop and an indie record label. 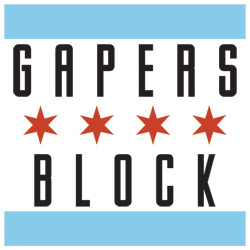 Will these new businesses propel Chicago Avenue to the next "hip" 'hood status? Maybe. Maybe not. Instead of the whole old-versus-new argument, there may be a way to fuse the neighborhood without depleting it of what makes it so special. If the changes occurred slowly, then maybe the original vibe of the hood could still be intact. Sure, it won't be seamless, but it may work. 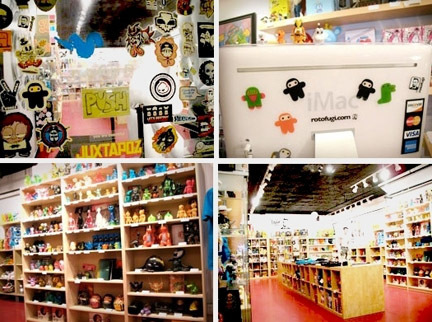 According to Kevin Kerr, owner of Rotofugi Designer Toy Store & Gallery, "Chicago is a city of neighborhoods and there's a constant change, but it's painful to see neighborhoods change so fast that real estate prices go up. People that are in the neighborhood can't afford to stay there anymore. That said, this neighborhood was gentrified a long time ago. I mean, I can't afford to buy a home in this neighborhood, but I can't afford to buy a home in a lot of neighborhoods. That's not necessarily a great thing for me to watch. I like that fact that it is slowly improving. Gentrification for a lot of these neighborhoods is inevitable. I'd like to see it happen kinda slowly, in moderation -- see the neighborhood get interesting without destroying what was originally good about it." 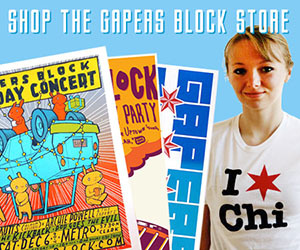 Jenn Frank, a sales clerk at Rotofugi, chimed in by saying, "Isn't it always the same story? It always starts out a rough and tumble neighborhood. Starving artists always move in. Then slightly less starving artists move in and then the bar and the boutique wants to move in next to the hip, hip artist enclave. Pretty soon, it's just boutiques and the artists move out because they can't afford it anymore." Indeed. The pulse of the old community was linked to the old theaters, department stores and restaurants. The Alvin is for sale. What a great little place this could be if it were resuscitated, if small businesses opened in all of the empty storefronts, in the storefront that will be vacant in the coming weeks when Rotofugi moves to its new location in Lincoln Park. And don't get them wrong, it's not because they don't love the area, but because they need more space. "We didn't look to move, we looked for a bigger space. We looked for locations that were off the beaten path," says Kerr. "When we moved here, we were pretty off the beaten path. We still are. I think this neighborhood is slowly crawling towards gentrification, but maybe in the right way." Everybody knows change is inevitable, but it may be possible to beautify the neighborhood without a massive displacement of its current residents. This is a great spot for families, new stores, galleries, restaurants and entertainment and everybody should have a chance to live here. "Are we happy because the neighborhood is changing? Yes, because it means new customers for us," Alcala said. Kerr loved the area from the beginning. "I think it's the right mix of bohemian, lots of artists and young families. It was the right fit for us. I like that the neighborhood is diverse. It's kinda like Mayberry." Now, if only Mayberry and Michigan Avenue would get married, the fusion would be complete. There are a VERY few remnants of a finer time (a VERY long time ago...) along Chicago Avenue. I have lived in the neighborhood over 10 years, and I can tell you that most of what graced the stretch between Damen and Ashland -with the notable exception of Alcala's-was CRAP like dollar stores and discount clothing places. Residents are NOT sorry to see those businesses replaced by independent restaurants, shops and galleries. And if this kind of 'gentrification' gets rid of the gang problems that continue to plague this area (check out the tremendous increase in gang graffiti in the area in the last 2 years), we say BRING IT ON...and nostalgia be damned! I'm surprised the article does not mention that the Goldblatt's building is now the home of a brand-new public library. I don't know when exactly it will open but it looks like soon. Dear Delilah, the neighborhood was home for, and a more than adequate one, several generations until city neighborhoods began their descent as suburban areas grew. Hence, the dollar stores and crappy clothing shops, as the area was left to those whom could afford to live there, in other words the urban poor. Of course now its chic has returned (or been returning) and now that the people and businesses that held down the area waiting for you to wake up and "discover" it, are no longer desired or acceptabel, they must be removed so that your darling shops and resturants and gallerys can take their place. It's all about money, the folks who lived there had little and it will be taken away by those who have lots more and want the area. Personally I liked it fine long before you and your ilk showed up. Re: "residents moved out and condos moved in"
FYI, condos are for residents too. They don't create condos just for fun. So you're essentially saying, residents move out and residents move in. Or are you saying residents living in condos are some kind of lesser form of resident? There's no reason to try to stigmatize urban homeowners. @ Lee – I apologize, but many single family home owners could no longer afford to live in the neighborhood. They moved out and new condos were built sometimes in their place. I wasn’t trying to stigmatize urban homeowners as a lesser form of resident. I actually live in a condo myself. I am interested in the artistic community in the Ukrainian Village, which does not get highlighted much here. For example with upstart gallery like Betty Dare, or cafe's which feature local artists, like Swim Cafe. This article focused quite a bit on the negative aspects of the neighborhood's change, but I would argue the arts community offers a glimmer of optimism. I just found this article and had to comment as I have a business that has been in the neighborhood since 1983. A medical supply store and who doesn't need medical items yet the business is rarely acknowledged. I grew up in this neighborhood and have now worked in it for over 30 years and this was THE shopping district for generations by generations. I've stayed waiting for it to turn around instead of leaving 6 years ago but so many just walk by instead of coming in. Of course-once someone googles medical supply stores and realizes that I am just around the corner- it's an are you new in the neighborhood moment. Stop-look in the windows-browse in any of these small mom & pop stores-think of it as trying a new adventure just like when you try a new dining hot spot.